The legislative, political and personality problems involved, coupled with the very real emergency on the border, indicate that, although he has said he doesn't want to, the president is actually left with only one viable option: declare a state of emergency. Beezer, southBronx and GeorgiaPeach like this. Every single one of these DACA applications needs to be investigated! Every one of them. Obama rubber stamped then and shoved them through. They lied, many have criminal records, many have stolen identities, used welfare and food stamps! 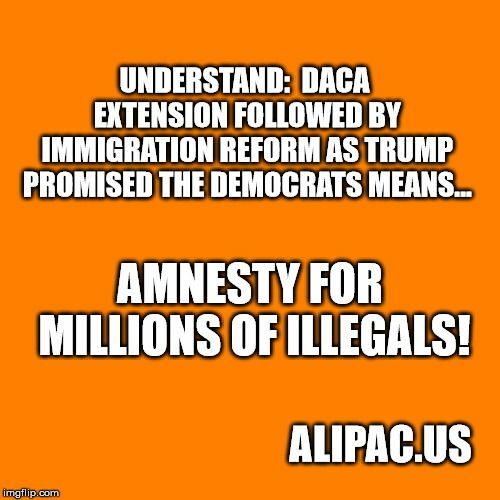 NO DACA, LET WORK PERMITS EXPIRE AND SEND THEM BACK HOME! OBAMA SHOULD HAVE NEVER DONE THIS! WE OWE DACA NOTHING...WE OWE AMERICAN'S AND KATE STEINLE FAMILIES 100% OF OUR SUPPORT TO STOP THIS! THIER PRESIDENT NEEDS TO CALL THEM HOME AND GO BUILD AMERICA ON THEIR SOIL. Judy, southBronx, stoptheinvaders and 3 others like this.